"There are no shortcuts to achieving worthwhile dreams"
Front Row (L-R): Bobby Kistner, Adam Scarzafava, Bobby Spindler, Matt Connors, Orlando Oliveras, Sam Sierra, Mike Gordon. Back Row (L-R): Coach Bob Spindler, Michael Scarzafava, Justin Santiago, Tom Vogel, Josh Braunstein, Matt Pontone, Nick Evans, Coach Frank Scarzafava, Coach Orlando Oliveras. Missing from photo: James Schwerdtman. 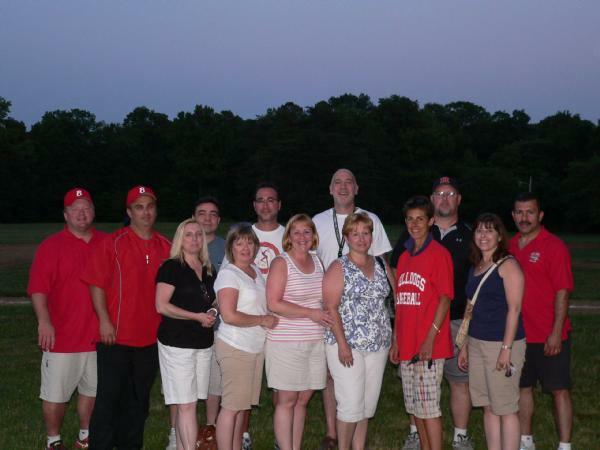 Some of the Bulldog parents had a great time over the week-end in Baltimore. Front Row (L-R): Joann Santiago, Nancy Scarzafava, Ginny Spindler, Claudia Oliveras, Amy Gordon, Maria Pontone. Back Row (L-R): Coach Bob Spindler, Coach Frank Scarzafava, Ephraim Santiago, Gary Vogel, Mike Evans, Russ Connors, Coach Orlando Oliveras. Wasn't This A Great Time In Our Lives? The N.J. Bulldogs are looking to top quality pitchers for our upcoming summer season. The season will begin Mid May and continue through approx. Aug. 1st. We will participate in the "New York Hudson Valley Summer League" (wood bat). We also plan on defending our 18/19U title at the Father's Day "Essex Baseball Tournament" in Baltimore, MD, and are in the planning stages of attending the "Dominican Baseball Classic" in the Dominican Republic in July. So, if you're a college or high school pitcher (19 or under), and can really throw some heat, we want to hear from you to set up a tryout. We also welcome top quality position players to tryout as well. Interested? Send e-mail and we'll get in touch. We are a mostly college freshman/sophomore team based out of Hasbrouck Heights, although we do have some top quality HS players as well. Our home field is Depken Field in Hasbrouck Heights. It is the same field the Hasbrouck Heights High School plays on. It is a turf field just completed this past fall. Directions to our field is just a click away. Simply click on "directions" from the left side menu. We have lights on the field, so games called because of darkness is a thing of the past. We plan on participating in many tournaments this year (check the handouts section), as well as playing in our league. "N.J. Bulldogs - for the ballplayer who takes his baseball seriously". Bunting in baseball is as important as blocking in football. In football if you can’t block you won’t move the football, you won’t generate any offense, and you will lose. In baseball, there is a “ho-hum, don’t ask ME to bunt” attitude. In failing to have a good bunting game players lose the other values of hitting that come from bunting concepts. The threat of the drag bunt keeps the flanks (third and first basemen) playing close to the hitter. This increases the hitter’s advantage to drive the ball past them. In sacrifice bunt situations, the good bunters have the ability to slash hit from a bunting stance, once again taking advantage of the drawn-in infield. The ability to drag bunt, sacrifice bunt and slash hit from a bunting stance will increase every player’s batting average at least 100 points. I did say 100 points! Coaches armed with a good bunting game have the weaponry to attack and score in adverse weather conditions, wind blowing in, cold and wet weather. The bunting game helps you create offense no matter what the occasion or condition. August 24, 2003 -- Listed on this page are the number of scholarships that colleges at each level are allowed to award for baseball. Scholarship amounts can be and are also regulated by conferences and individual programs. Some NCAA Division I and II teams offer no scholarships in baseball. There was a man who was walking along a sandy beach where thousands of starfish had been washed up on the shore. He noticed a boy picking the starfish one by one and throwing them back into the ocean. The man observed the boy for a few minutes and then asked what he was doing. The boy replied that he was returning the starfish to the sea, otherwise they would die.The man asked how saving a few, when so many were doomed, would make any difference whatsoever? The boy picked up a starfish and threw it back into the ocean and said "Made a difference to that one..."
League Lineup (our webmaster) has added a new "Fieldhouse Store" filled with all kinds of apparel for everyone to look at and purchase. Just click on "Fieldhouse Store" on the left side menu, and it will take you to our store. A percentage of whatever you buy, goes back to our ballclub. If your game is listed in "Upcoming Games", and there is a field listed, you can find directions to that field by clicking on "directions", then click on the name of the field you will be playing at. 90% of all fields are listed. 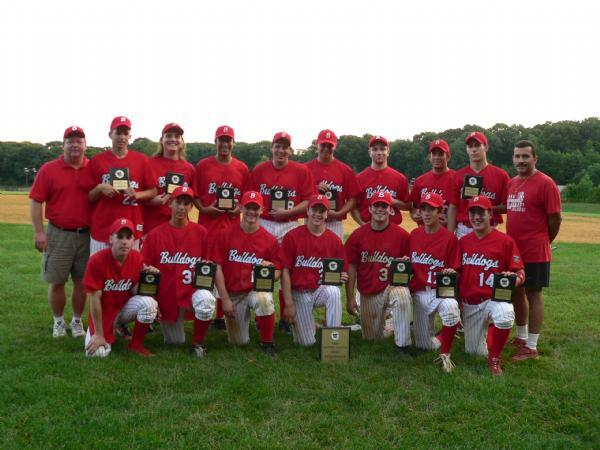 The 16U Bulldogs brought home the 18U Cerbo League Trophy by defeating Parsippany Hills 5-4 in the league playoff finals. Congratulations! Check the game summary for all the details. The N.J. Bulldogs travelled to Allentown this past week-end to participate in the 7th Annual Halloween Bonanza. After a first round loss to the Lehigh Valley Demons 8-6, the 'Dogs showed their determination by trouncing the Lehigh Valley Dodgers 11-3 on Saturday afternoon. The seedings were then announced for the following morning, and the Dogs were seeded 3rd. We played the 6th seed, the Lehigh Valley Dodgers, and the going into the 7th inning holding a 7-2 lead, things got a little hairy but the Dogs held onto a 7-6 victory. Now, onto the 2nd seed Lehigh Valley Demons again. This time, however, it was a different ballgame, with the Bulldogs on the winning end of a 3-1 game. It's now onto the finals against N.J. Lefty's Lightning. We got into the 2nd inning when the heavy rains came and the game had to be canceled. The result was Co-Champions. It wasn't the way we would have liked to end it, but nobody can beat Mother Nature. So, Congratulations Bulldogs! 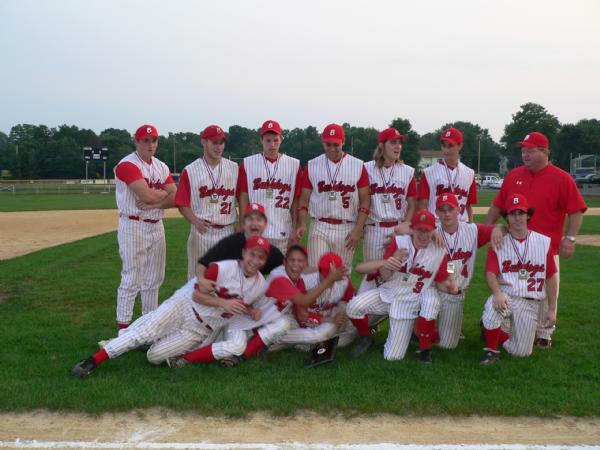 The N.J. Bulldogs won Back to Back Summer League 18U Championships in the Cerbo League for 2005 & 2006. The final game was a real nail-biter, with the 'Dogs coming from behind in the top of the 7th. Congratulations Dogs on a job well done! 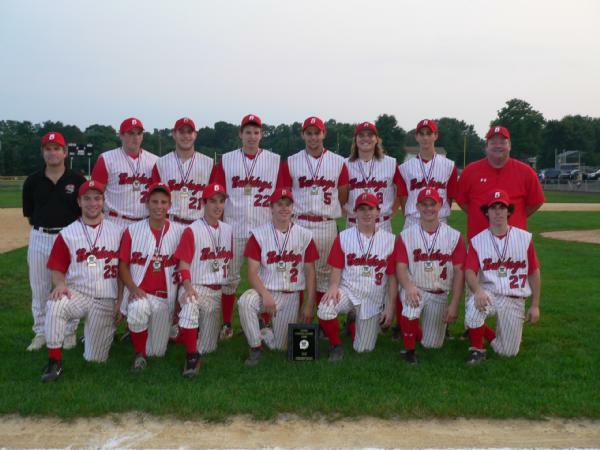 Some new photos have been added to the 18U photo album. Just click and enjoy. 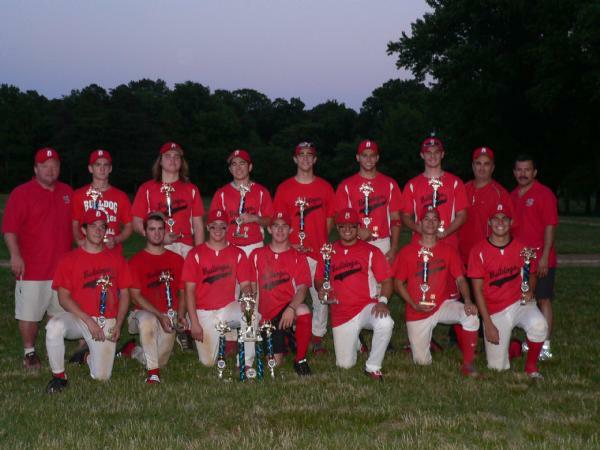 The N.J. Bulldogs brought home the championship in the "Essex Baseball Tournament" in Baltimore, MD this past Sunday. The boys swept all the games they played. Plus they got to see a great Orioles-Diamonbacks game on Saturday night. Details under "game summaries".